Jeffrey S. Copeland opens a window into the writing process, influences, work habits, and personal backgrounds of sixteen of today’s premier children’s poets and anthologists, many of whom have won the NCTE Award for Excellence in Poetry for Children. These writers — including Arnold Adoff, Jimmy Santiago Baca, Eloise Greenfield, Myra Cohn Livingston, and Valerie Worth — provide not only critical discussions of their poetry but also ideas about how teachers can help kids understand poetry and enjoy writing their own. 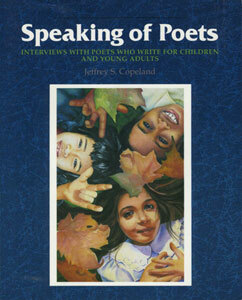 “Some of the top children’s poets and anthologists in America share their views on their own work and the role of poetry in children’s lives in Speaking of Poets…Young writers and regular students will benefit from being introduced to these speakers who believe in the power of poetry to articulate meaning.”—Curriculum Review, Vol. 33, Issue 4. 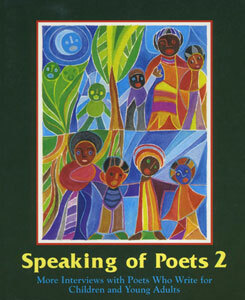 Speaking of Poets 2: More Interviews With Poets Who Write For Children And Young Adults examines the lives and works of twenty of today’s most popular and critically acclaimed poets. Included are such award-winning writers as Cynthia Rylant (Newbery Medal), Ashley Bryan (Lee Bennett Hopkins Poetry Award), Paul Fleischman (Newbery Medal), and Maxine Kumin (Pulitzer Prize for Poetry). All of these poets share personal reflections and critical analyses of their own work, offer insight into how they work as writers, and provide useful suggestions for young poets.